AT&T gives a few updated smartphone models from previously releases available. The update contains the Samsung Galaxy S4 which is right now available in a 32GB model. As reported previously the Galaxy S4 with 32GB built-in memory will be available on May 10. 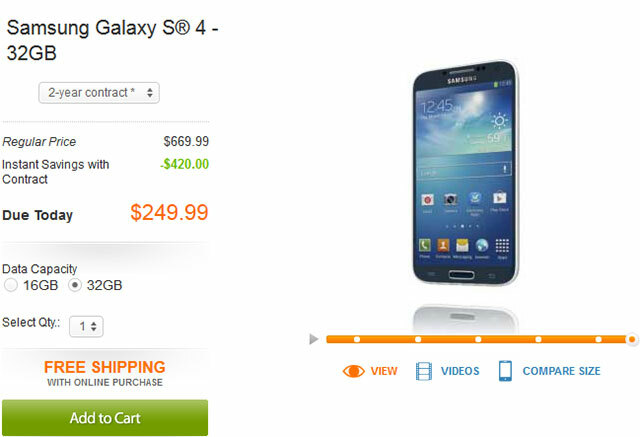 The 32GB Galaxy S4 are available on the AT&T website now. AT&T priced this model at $249.99 on a two-year contract. Additionally, the full retail pricing is $669.99. Rather than 16GB Galaxy S4 which is available in black or white, the 32GB Galaxy S4 is only available in black. For comparing reason, the 16GB Galaxy S4 is priced at $199.99 on a two-year contract. Samsung Galaxy S4 comes pre-loaded with Android 4.2.2 Jelly Bean with Samsung Nature UX, while the camera on the back has a 13 megapixel sensor with LED flash, autofocus, and full HD video recording support. You can get the AT&T Samsung Galaxy S4 32GB buit-in memory by pointing your Web browser to HERE.